It’s an odd feeling to walk away from a movie feeling that it is not as bad as you feared, yet also not as good as it seemed it could be. 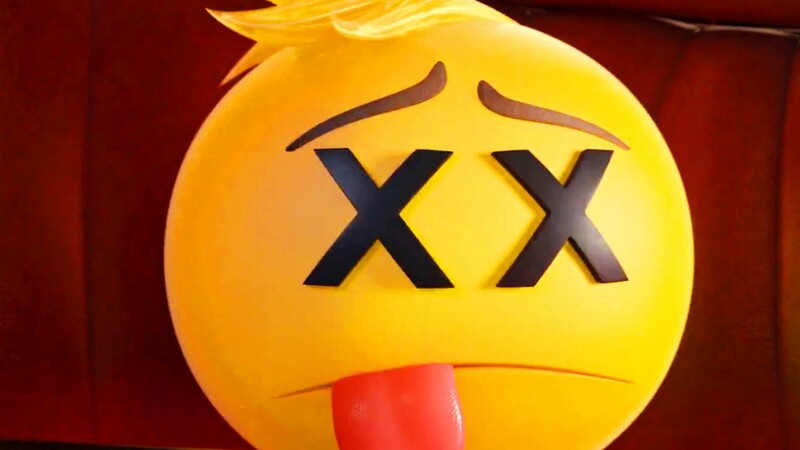 “The Emoji Movie” is one of those terrible ideas that comes along once in a blue moon when a company is desperate enough to try anything – and I mean anything – in hopes it will connect. For a cash strapped company like Sony, making a movie about the emoji’s people use on their phones must have sounded like good business on paper. Everyone is familiar with them, they could design their own trademarked versions of the icons, and no royalties would need to be paid in licensing. Plus, kids love them! They are using them in texting all the time on their phones! I would also argue that most kids are on their phones too much to care about going to the theaters to see a movie about emoji’s in the first place, but let’s focus on one problem at a time, shall we? After all, once you’ve got it in your head to make a movie about emoji’s the real question is what does it look like? The answer, believe it or not, is kind of creative. I sort of liked the look of Textopolis, where emoji’s of all diverse kinds live. They talk to each other, have families, and they have the important job of being there for Alex, the kid who owns the smartphone they live in. Item emoji’s have it easy because they just have to stand there, but facial emoji’s are the ones who bring it home; they must keep the same facial expression all the time, just in case they need to be used on the fly. This can be difficult if you are the smiling emoji and have just broken your arm or the sad emoji who just won the lottery. The emoji who appears to be having difficulty with this concept is Gene (T.J. Miller), who is supposed to be a “meh” emoji, yet finds himself walking around with a variety of different emotions. This is such a problem that even Poop (who I’m sorry to say is voiced by Sir Patrick Stewart…who I’m certain lost a bet if he agreed to be in this) gets more respect then he does. Because he has different emotions, he must travel outside the app with Hi-5 (James Corden) and Jailbreak (Anna Faris), while traveling through the Just Dance and Spotify apps, all to get to the wondrous place known as ‘the cloud,’ which is found at Dropbox. While the movie had been struggling for a bit before we got to this point, this is where the movie stopped being a movie and started being a commercial for smartphones. A main subplot of the ‘film’ involves Alex trying to talk to a girl and not being able to get her attention because he doesn’t have the right emoji to send her. In my day, we used to talk to girls we were interested in asking out on a date. “The Emoji Movie” presents two worlds: one where kids live life through their smartphone and another where smartphone codes walk through blatant product placement that could be funnier if the producers weren’t trying so hard not to offend their sponsors. I don’t want to spoil too much, but it also bothers me that the ‘message’ (ho ho) of the movie is that more smartphone use is a good thing, where I believe smartphone usage with kids is a big problem and should have been addressed a long time ago as such. On the positive, I can’t say the movie is evil or nearly as insulting as it easily could have been. The idea of hiring Patrick Steward to voice Poop still irks me greatly, but a little bit of effort WAS put into it! On the other hand, the execution is rather bland and boring, with a message that is pretty offensive the more I think about it. 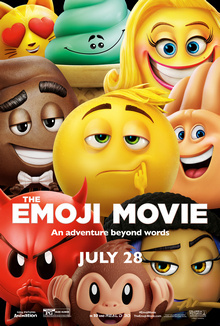 Whether or not kids will want to return to the theater to see something like “The Emoji Movie” is a debatable question, but the more pressing one is if this is what they want to watch, should they even bother? Parents, there is nothing (objectionably) wrong with this movie. Recommended for all ages.